It has been some time since the word “subprime” was voted word of the year. Six years to be exact. And since then, the word subprime has really only been uttered in the past tense, often with contempt. You know, like subprime lawsuit, or subprime default, or some other combination of words that cast subprime in the worst possible light. In the mortgage world, subprime mortgages are generally characterized as having FICO scores below 620. These days, such loans are hard to come by, though there may be a small handful of lenders willing to offer loans to those with credit scores below that magical cutoff. But even if you can get your hands on a subprime loan, the mortgage rate will probably be relatively unattractive, seeing that the pricing adjustments for credit scores that low are steep. Over the past five years or so, FHA loans grew insanely popular as conventional lenders raised credit standards, effectively eliminating their subprime offerings. The FHA actually permits lending to borrowers with credit scores as low as 500, though most individual lenders require much higher scores, such as 640 or higher. Put simply, lenders impose overlays above the minimum requirements to avoid winding up with a ton of bad loans that end up in default or foreclosure. In 2010, Wells Fargo began accepting 500 credit scores for FHA loans after being pressured to do more, though such loans needed to meet additional criteria, such as a larger down payment. So the guidelines can be a bit misleading if no lender is actually willing to live up to them. And those that do may have a fly-by-night element to them. Additionally, the FHA is aware of its newfound subprime status, and has taken a number of steps to tighten the reins after getting grilled by lawmakers. For example, they established a minimum credit score of 500, and now require a score of 580 for their infamous 3.5% down loan program. In the past, it was pretty much wide open, assuming a lender wanted to originate such a loan. And the latest FHA change deals specifically with subprime borrowers – underwriters now require compensating factors for borrowers with sub-620 credit scores and debt-to-income ratios above 43%. So even the FHA is trying to distance itself from the word subprime. The industry’s avoidance of subprime isn’t just chatter. There are real numbers that reveal a major decline in subprime lending. 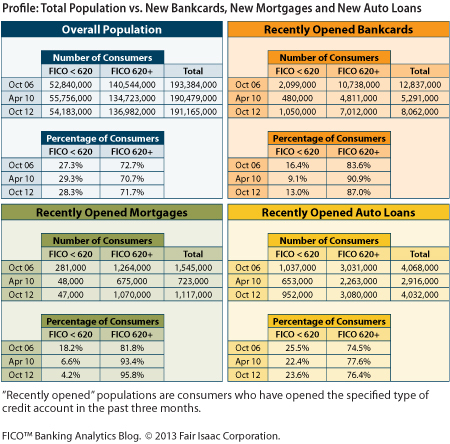 In fact, FICO recently noted on its Banking Analytics Blog that just 4.2% of recently opened mortgages went to borrowers with FICO scores below 620. As you can see from the graph above, just 47,000 subprime mortgages were originated between August and October of 2012. The total is actually down from the 48,000 originated during a similar period in 2010, and nowhere closed to the 281,000 handed out during the boom in 2006. Back then, the subprime share was nearly 20%, which explains why so many mortgages went bad so quickly. Interestingly, the trend in mortgages isn’t seen elsewhere. If you look at comparable numbers for credit cards and auto loans, subprime is very much back. Meanwhile, those with really poor credit are mostly left out of the new mortgage world. The big question remains – will the subprime mortgage return, and if so, when? But instead of sitting around and waiting for subprime lending to make a spectacular return, work on getting yourself out of the subprime realm. If your credit score is in the dumps, take steps immediately to improve it. You don’t want to be a subprime borrower, even if you can get approved for a mortgage. Assuming you are able to get your hands on a mortgage with a low credit score, you’ll essentially pay an arm and a leg for it. You’ll also be highly scrutinized during the loan process, which won’t make for a wonderful experience. There’s another big issue – it’s a seller’s market. If you get pre-approved with a low credit score, you’ll probably be overlooked by the seller. They’ll want to know that their prospective buyer has a great chance of closing their loan – someone with a 620 credit score (or anywhere near it) doesn’t look so good. Regardless, why subject yourself to higher rates and limited options? If you don’t know why your credit score is low, speak with a professional. If you know what’s ailing you, tackle it. Unfortunately, time is often a key ingredient in improving one’s score. So you may just need to be patient as well, especially if you were foreclosed on, or had to sell your home short.